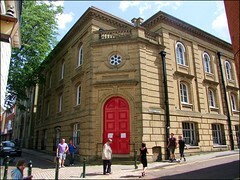 This thoroughly urban United Reformed Church is shoehorned into its site on the corner of narrow Princes Street and Redwell Street, facing across to St Peter Hungate, now home to the Hungate Medieval Art centre. 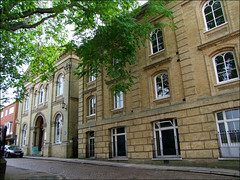 The yellow brick frontage is Classical in style, with three bays under a simple pediment, with the church's other buildings ranging westwards and making an imposing second entrance on the corner. The frontage was redone in the 1990s with the insertion of glass doors, opening up a pleasing vista from the street to the Father Willis organ at the far end, although in fact this church is open to wanderers most mornings. 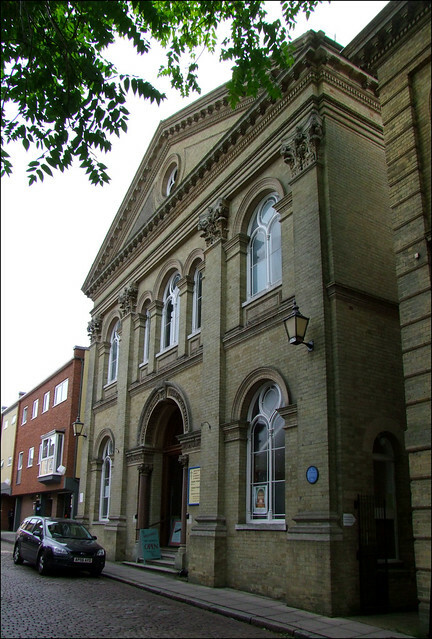 It was built in 1869 as Princes Street Congregational church to the designs of the major Norwich architect Edward Boardman, who was a member of the congregation here. The extended range to the west is of a decade later, the note of gravitas arising, perhaps, from non-conformism's increasing influence in this poor district. The interior is a joy, decked out in the rich, bright colours of the High Victorian period. The wrought iron screen to the three-sided gallery is exquisite, a tribute to the patronage of the Dixon family who were iron founders in Norwich. The numbered pews are original, making this all of a piece, and one of the best interiors of the 1860s and 1870s in the city. The United Reformed Church are fairly stolid middle-stumpers in the labyrinthine world of non-conformism, but a reminder of headier days is the memorial to Oliver Fellows Tomkins, a former member of this church, who, in 1899, went as a missionary to New Guinea, where he laboured until 8th April 1901, when his life was taken by the natives. He was 28 years old. A few short years would separate the demise of Oliver Tomkins from the loss of so many other boys of this church in the hell of France and Flanders: the elegant marble plaques recording more than forty names still flank the entrance into the church today.